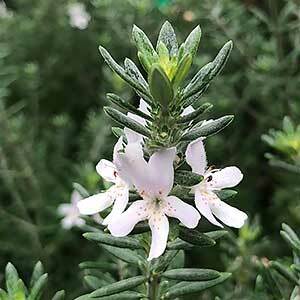 One of the most popular of all varieties available for sale of the Westringia fruticosa is what we know as ‘Coastal rosemary’ and sometimes ‘Native rosemary’, an excellent low native hedge plant. And although at a glance some similarities do exist with its namesake it stops right there. 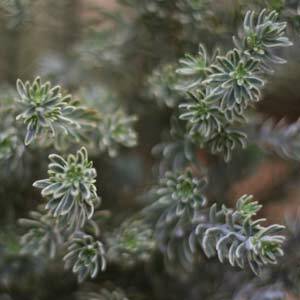 Originally from the coastal areas of NSW this is a hardy easy to grow small shrub, drought tolerant and easy to prune. An excellent choice as a native hedging plant. Westringia fruticosa is indeed an Australian Native plant, with some of the better cultivars being ‘Jervis gem’, Smoky’, ‘Naringa’ and ‘Wynyabbie Gem’ all of which are used widely as hedge plants. Smaller growing varieties to 100cm include Westringia “Elizabeth Bough” and “Starry Night”. Pictured above right is Westringia fruticosa variegata. You may also like Westringia glabra which has a more open growth habit. Left to its own devices the species will reach around 4m in height, with attractive grey green foliage and mauve flowers in spring Westringia fruticosa and its cultivars are widely used as hedging plants. It is salt tolerant and frost resistant, however when growing in containers be a little careful not to let it dry out completely. In terms of fertilizer, a low phosphate Australian Native plant fertilizer is best. As this is a fast growing plant it is excellent for establishing hedges. Try a spacing of 150cm for a nice dense hedge. This is a plant that lends itself to be pruned into an informal hedge where it can be allowed to develop a series of rounded shapes. Height – To 4 metres. Spread To – To 2 .5 to 3 metres. Position – Full sun to a little shade for part of the day. Soil – Humus rich well drained. Suited to sandy coastal soils and almost any well drained soil. 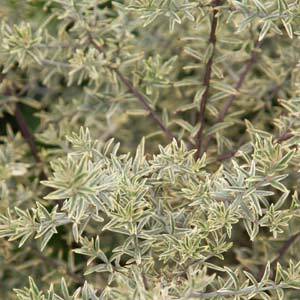 Flowers – Small white to mauve from spring to summer however with spot flowering through the year. Foliage – Narrow leaves with fine hairs on new growth. Green to grey, some with variegation.